We provide pest control services for all of London Essex and Hertfordshire. The most common pest control services needed in London are for rodents, especially rats, and urban foxes. Bird control problems are common everywhere including London and plenty of damage can be caused by pigeons and starlings. Some pests in the cities can be more resistant to treatments but with our experience we know what works best where. 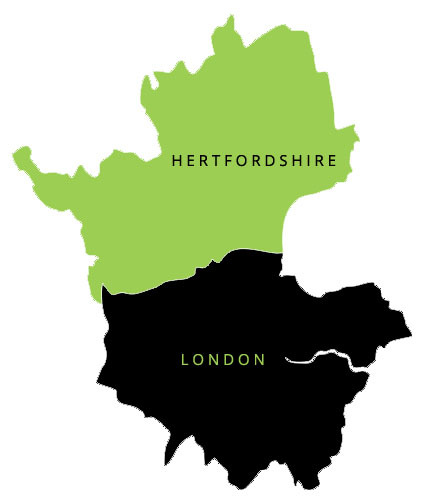 Although Hertfordshire has many large towns and cities that face the same problems like Stevenage, Welwyn, Hatfield and Watford, it also has more rural locations. In rural Hertfordshire many of the villages we've worked in like Henlow, Codicote, Wheathampstead and Radlett, pests like moths, squirrels, mice, bugs and beetles can often be more of a common problem. Property boundaries can be more porous and difficult to secure so the expert knowledge of our technicians at being able to spot entry points is invaluable.